India and Vietnam continue to expand their strategic security cooperation. 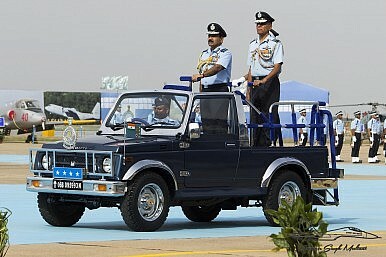 The Indian Air Force’s (IAF) chief marshall, Arup Raha, arrived in Vietnam on Thursday, where he was received by Vietnam’s minister of defense, General Phùng Quang Thanh. Raha is in Vietnam for a three-day visit where he will meet with a range of senior Vietnamese defense officials and discuss military cooperation between the two countries. Raha’s visit emphasizes the ongoing strategic convergence between Hanoi and New Delhi. Both India and Vietnam have expanded their defense cooperation in recent months, with high-level discussions about security cooperation becoming relatively routine. Thanh, according to a report in Vietnam’s Tuoi Tre, “hailed Raha’s visit, considering it a boost to the traditional friendship, mutual understanding and trust between the two countries and peoples, particularly in defense ties.” To date, India and Vietnam haven’t focused specifically on air force cooperation, preferring instead to build their security ties around maritime security. The specifics of Raha’s agenda in Hanoi remain obscure for the moment. In broad terms, Vietnamese reports notes that the Indian air chief’s agenda will be broad enough to address strategic security cooperation between the two countries. In under a year, India and Vietnam have generated considerable energy in moving their strategic partnership forward. Part of this is due to Hanoi’s growing perceptions of a threat from China after last summer’s oil rig stand-off in the South China Sea. As of 2015, Vietnam is also the country coordinator for relations between the Association of Southeast Asian Nations (ASEAN) and India, a position it will hold for three years, up to 2018 (Carl Thayer has discussed that in more detail in The Diplomat, here). For New Delhi, Vietnam has always been an important node in the country’s long-stated “Look East” policy, which the new Indian government has recast as as the more energetic “Act East” policy. As I wrote in these pages in May, General Thanh visited India for three days. His time in New Delhi was productive, resulting in a range of memorandums of understanding (MoU) between the two countries. Thanh’s time meeting with Indian officials, including his counterpart, Indian Defense Minister Manohar Parrikar, was focused on maritime security in particular. Thanh’s trip resulted in a Joint Vision Statement, which set out a road map for Indo-Vietnamese cooperation on defense cooperation. Thanh and Parrikar signed an MoU on defense and another on coast guard cooperation. Thanh’s visit carried on the momentum generated during Vietnamese Prime Minister Nguyen Tan Dung’s October 2014 visit to India. During that visit, New Delhi agreed to supply four patrol vessels to Vietnam (incidentally mirroring similar initiatives to bolster Vietnamese maritime security by Vietnam and the United States). Narendra Modi Was in Southeast Asia. Did He Act East? Indian Prime Minister Narendra Modi was in Malaysia and Singapore last week. What did he accomplish?